Who says you can't use your slow cooker outside of the cold winter months? For entertaining or an easy weeknight meal, this simple slow cooker pork carnitas recipe is the best! Gather together a pork roast, and chicken broth, along with a few spices you probably already have in your pantry - garlic powder, ground cumin and coriander, oregano, bay leaves, cinnamon - and pop it all in the slow cooker. Let it cook all day (or overnight), then remove it from the slow cooker, shred it with a fork and soak in a bit of orange juice. Then, if you want to crisp up the meat, pop it in a 400 degree F oven for 15-20 minutes. 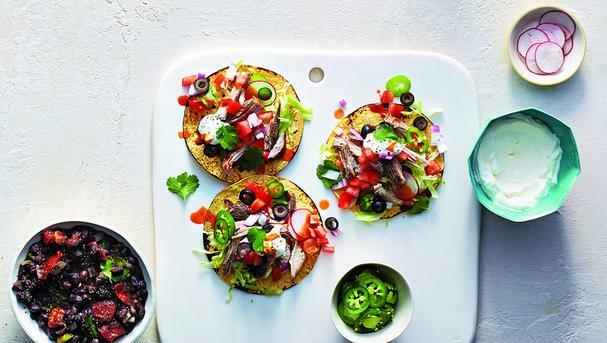 Set up a taco bar with your favorite toppings and let your guests build their delicious pork carnitas tacos (see suggestions below). 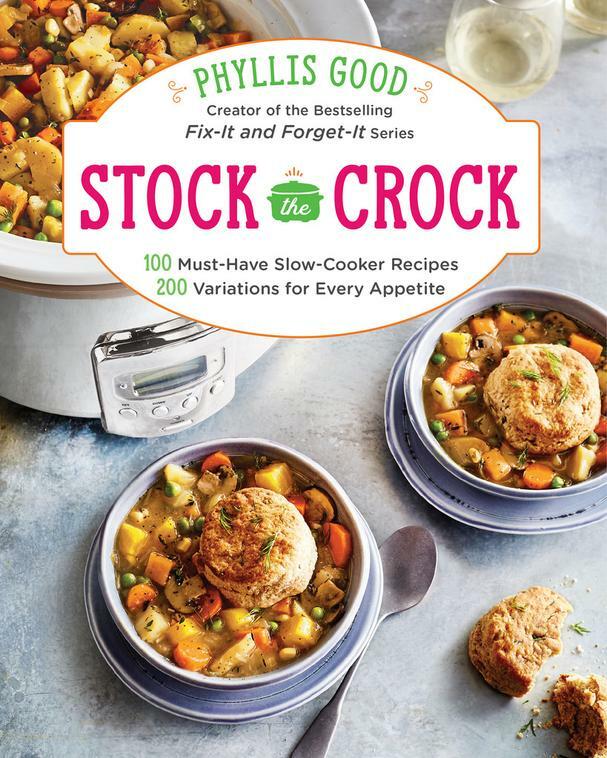 The following recipe is courtesy of Stock the Crock by Phyllis Good. This must-have cookbook includes 100 essential slow cooker recipes as well as over 200 variations for dietary preferences or restrictions such as gluten-free, vegan, vegetarian, Paleo-friendly, cooking for one or two, even picky eaters. 1. Grease the interior of the slow cooker crock with butter or nonstick cooking spray. 2. In a small bowl, mix together the salt, garlic powder, cumin, oregano, coriander, and cinnamon. Rub the spice mixture all over the pork roast, holding it over the cooker so any get-away spices fall into the cooker. Lay the rubbed roast in the prepared crock. 3. Pour the chicken broth down along the sides of the cooker (you don’t want to wash off the rub). Lay in the bay leaves. 4. Cover. Cook on Low 8 to 10 hours, or until the pork shreds easily with a fork. Remove and discard the bay leaves. 5. If you’re home, turn the meat over after it has cooked 4 hours. If you can’t do this, the flavor will still be good. 6. Remove the pork from the crock and use 2 forks to shred it. 7. Place the shredded meat in a bowl. Stir in the orange juice. Add some of the liquid remaining in the crock to moisten the meat as much as you want. 8. If you have time, preheat your oven to 400°F. Spread the meat on 1 or 2 large, greased baking sheets. Bake it for 15 to 20 minutes, or until the meat begins to crisp on the bottom and around the edges. Then broil it for 5 minutes or so, drizzling it with additional sauce so it continues to get crispy but doesn’t burn. 9. Serve the pork as filling for tamales, enchiladas, tacos and/or burritos, with desired toppings. Or, serve it on buns or over white rice. To thicken the sauce: In a small bowl, mix 3 tablespoons cornstarch with 3 tablespoons of cold water. Stir until a smooth paste forms. Remove 1⁄4 cup of heated sauce from the cooker and mix it into the cornstarch-water paste. When smooth, return the sauce to the crock, stirring until the sauce thickens. For additional flavor: Lay 1 onion, peeled and halved, next to the roast in Step 2. Reduce the amount of chicken broth to 1 cup in Step 3. Then squeeze 2 tablespoons fresh lime juice over the roast. Squeeze fresh juice from 1 medium-large orange over the roast too. Lay the spent orange halves beside the roast. Lay in the bay leaves. Continue with Step 4 and the following steps. Remove the orange halves before shredding the meat. Taste before adding more orange juice in Step 7. Check the label to ensure you are using gluten-free chicken broth. Make lettuce cups by spooning 1⁄2 cup of the shredded pork into the middle of single large romaine lettuce leaves. Fold each leaf up from the bottom and in from the sides. Roll the top down to create a refreshing lettuce-wrapped package. Go light on the sauce when you serve the carnitas. Excerpted from Stock the Crock by Phyllis Good. Copyright © 2017 Oxmoor House. Reprinted with permission from Time Inc. Books, a division of Time Inc. New York, NY. All rights reserved.